Poinsettias are one of those plants you find in every store during Christmas season, and at the curb shortly after Christmas. It really does not have to be that way, since with proper care you can save your Poinsettia until next December, and admire fresh blooms for Christmas. 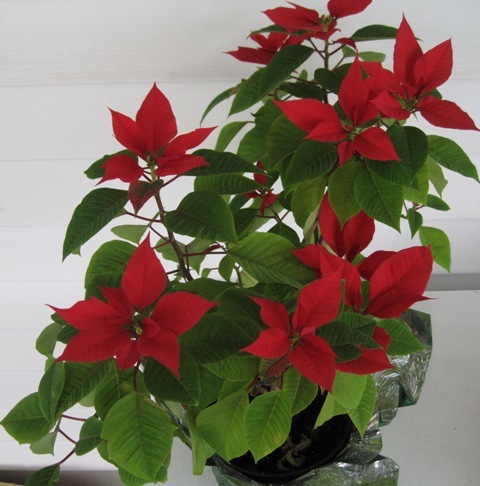 Expose your Poinsettia plant to indirect sunlight for at least 6 hours each day while it is blooming. Keep it slightly on the dry side, so please do not over-water. Do not fertilize during flowering time. Apply all-purpose fertilizer, after the plant has finished blooming. Cut it back in early spring. New growth will begin to appear later in the spring. You may keep it outdoors for the summer, once all danger of frost is gone. Fertilize more frequently during the summer months. Prune the plant, to keep it from getting leggy. Bring it indoors in early fall, once the temperature begins to cool. It will set buds and produce flowers during November or December. During October, November and early December, keep it in total darkness for 14 hours each night (no peeking). Any stray light will upset the schedule. Allow 6-8 hours of bright sunlight. Once you follow these steps, you should be able to save money by not needing to purchase a new Poinsettia for the upcoming Christmas, and enjoy the old Poinsettia in a new full bloom. Please share your experience with Poinsettias, if you have plants that have been saved from the previous year. Would you believe that I’ve never had real poinsettia in my apartment or in our house while I was growing up? I always seem them in plant stores, though. It is always nice to get one as a gift. This year I just bought one for myself, because I just love their vibrant look. I will try to follow these steps to preserve it, because last time my timing was off and I did not get nice blooms the following year.